Co-authoring a book to give to a child who had a birthday in our room. The crowns were made first! My young writers continue to amaze me! We make books daily in our 45 minutes to an hour Writer’s Workshop and many children protest when it’s time to stop. But what about those friends who only last 5 minutes or so? You know them…you hand them their writing folder and before you’ve finished passing out the rest of the pile you hear it…”I’m done!” When I taught first, second and third grade we learned on the first day (a la Lucy Calkins), “when you’re done, you’ve just begun!” Children knew that writers were never “done”. 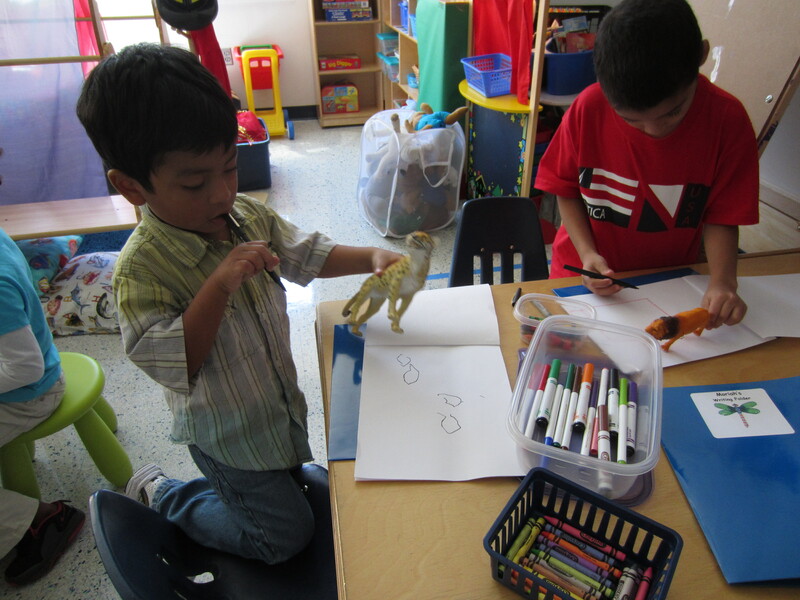 They knew to add to the words or pictures, read their book to a friend for more ideas or start a new book. But I think it’s different in kindergarten (and I would now argue in first grade as well…and even second grade…). Developmentally, 4, 5 and 6 year olds may not be ready to stick with making a book for such a long period of time. A lot of them are – but there are kids in every classroom who just aren’t there yet. The last thing I want to do is to force them to sit quietly and make books. All that’s going to do is make them hate writing. When children proclaim they are “done”, I first ask them to read their book to me. Of course, at this point in kindergarten it’s usually reading the pictures. Then I ask them what they need to do next as a writer. I make sure my talk during this time continues to refer to them as writers, and helps them see different possibilities for what “writing” might look like. Perhaps they need to go find a stack of Mo Willems books to look at to get an idea for their next book. Maybe they need to get the toy dinosaurs out and create a scene to get an idea for their next book. Maybe they need to pull out the storytelling kit that goes with a favorite read aloud and make up a new story. I honor what the needs are at that moment, and make sure I’m not forcing the writing piece. I play the role of a gentle encourager, helping my young writers see possibilities for sharing themselves with their classmates and the world. As I writer, I know that some days I just don’t feel like writing. I want to express myself in another way. I know that I will get back to writing tomorrow, but for now I need something else. I think our young writers feel this way too. Sometimes what my writers are doing during Writer’s Workshop isn’t making books. Maybe today as writers they are making crowns or invitations for the afternoon Explore time when the princess party will resume. As I chat with these writers, I may suggest that a “how to make a crown” book might be just the thing for the future princess party attendees. Maybe painting a picture similar to an artist we are studying is what a writer is doing. They are using a piece of art as a mentor text instead of a book. Another child may be talking to an iPad or computer as he makes a book in one of the many creative apps we have on our iPads or computers. Maybe a group of children are composing a dance to share the butterfly life cycle. They are drawing the cycle and deciding ways to act it out. Maybe another group of children are Tweeting or blogging and talking to children all around the world. The point is, writer’s workshop can (and does) look different for all children, depending on what they need at that moment as a writer. While all of this is going on, many children are bent over their books and writing folders in what looks like a more traditional writer’s workshop – writing, drawing, creating. But others are moving, playing, talking, painting, creating like children do. And that’s OK. It’s the energy of children “making stuff”, as Katie Wood Ray talks about. And all of that “stuff” is and will become texts in many different modalities for children to share and express themselves through. And that’s what really matters to me – that is the purpose of our Writer’s Workshop. I love the idea of asking them what they need to do next as a writer. This not only gets them to think about the job of a writer, but it also teaches them self-regulation for their own learning. 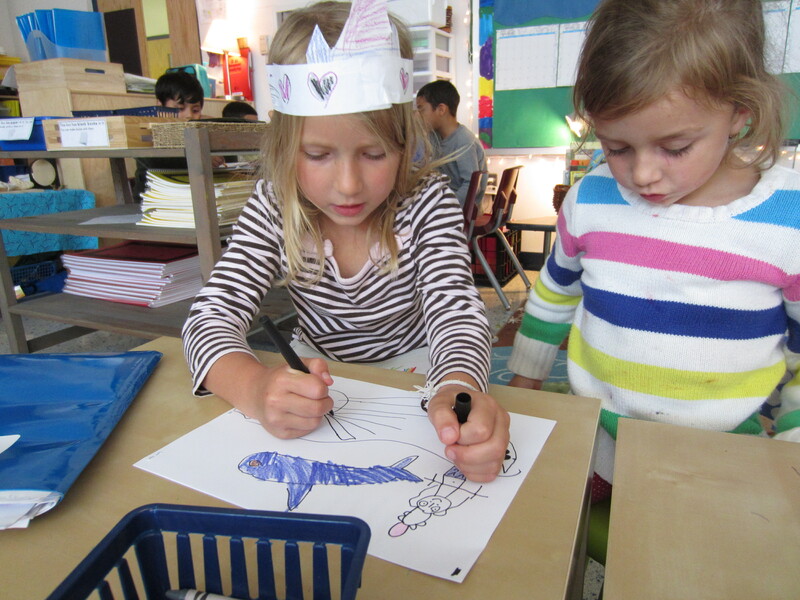 So many creative ideas as our kinders get ready for their “writer’s workshop. Wonderful! Thanks for the reminder that telling a story or sharing information can be done in a variety of ways. I sometimes have writers who use pictures to tell their story use photo booth to share their story. Sometimes I snap pictures of the story and place the audio retelling of the child’s language in Evernote. Applications and Web 2.0 tools do add a variety of ways students can share their writing. Writer’s who finish quickly do need time to develop stamina for the task…and this often means developing a set of strategies for sharing stories. I find pulling small groups of these children for shared & interactive writing to help writers understand the process. I had to smile as I thought about those writers who are done quickly in our classrooms. Their writing folders are usually quite full in comparison to students who can work on a piece for a longer period of time. Thanks for the reminder to honor the many modalities of sharing story. Self-Monitoring: Watch for it, teach it, support it!